As a construction worker, you need to wear work pants to protect yourself from the dangers on the building site. The work pants also protect the clothes you are wearing underneath from dirt and wear. To get the most from the outfits, you need to buy the best work pants for construction. 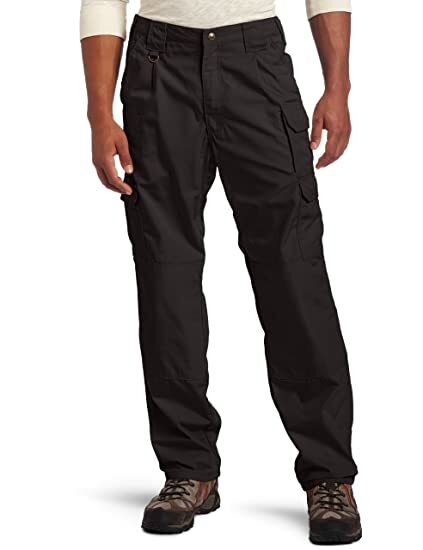 These work pants are made from a blend of polyester and cotton which makes them very lightweight. This makes them highly convenient as you can wear them for a long time without getting exhausted. The convenience of the pants also comes in in the many pockets that are strategically located on the pants in areas that you can easily reach. Since there are many pockets, you can store as many tools as you want. As mentioned above, one of the factors you should consider when buying the pants is the comfort. Since they are made from lightweight materials, you can be sure that they will be comfortable. The pants are also a loose fit and have enough room both in the seat and thigh areas. Due to the loose-fitting design, you can expect that the pants will have wide leg openings that allow you to wear your safety boots quickly. The comfort of the pants is extended by the presence of the casual waistband that makes it possible for them to fit perfectly in your waist. At the time of time of writing this review, the pants have over 4,000 reviews and a 4.2-star score out of the possible 5. Most of the reviews are positive such as “I wear them daily both indoors and outdoors,” “I will be wearing nothing else now! ” “fantastic pants! ” “practical, tactical, and comfortable,” and many others. While most of the reviews are positive, some people have complained about the sizing; therefore, you need to be cautious and ensure that you order the right size. These pants have many features that make them one of the best pants in the market to go for. When it comes to convenience, the outfits have a flat-front design that comes in a straight-leg silhouette that features a wide waistband with tunnel loops. This makes the pants fit you nicely. The pants also feature rear and back welt pockets where you can store as many construction tools as you want. This eliminates the need to keep on leaving the site to get the tools. Since the pants are reinforced, you don’t have to worry about making holes in them regardless of the tools you have. The zip fly with hook, and eye closure further contributes to the convenience of the pants. Due to the closure, you don’t have to struggle with the zipper especially when you are in the hurry of going to the bathroom. When it comes to comfort, the work pants have an expandable waistband. This feature allows you to comfortably wear the pants regardless of the size of your waist. For the pants to last for a long time, it’s paramount that you go for those that are made from the tough material. 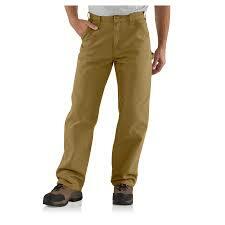 These work pants are made from 65% polyester and 35% cotton. While this material isn’t too tough, it has the potential of lasting for a long time when you take good care of it. At the writing of this review, there are more than 5,800 reviews, and the work pants have an average of 4 stars out of the possible five stars. While most of the customers have positive experiences with the pants, there are a few that had issues with the size. Some complained that the pants were too big while others said that they were too small. You just need to be cautious and ensure that you double check your size so that you can order the right one. The pants are made from 100% cotton thus you can be sure that they will be comfortable to wear. The outfits also have a relaxed fit which makes them more comfortable to wear the entire day. When it comes to the convenience, the pants have a carpenter-style hammer loop where you can hang your hammer and other tools you need for your work. 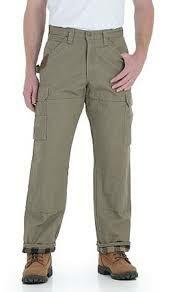 The vertical pockets also play a vital role in making the pants more convenient to wear. As mentioned, the pants are made from 100% cotton thus they are not only comfortable to wear, but also durable. The pants also feature reinforced knees thus you don’t have to worry about the knees wearing out faster than the other parts of the pants. If you are looking for a fabric that will last for a long time, you should order ripstop fabric or dura-shield denim pants. The work pants have over 1200 reviews at the time of writing this review. Out of the possible five stars, the pants have 4.3 stars which is very impressive. Despite the many positive feedback, there are a few customers that complained that the pants took time to break in. Others complained of the pants being a little big or smaller than their size. Other than the work pants being made from 100% cotton, the outfits also have many other great features that make them an ideal choice for your construction projects. When it comes to the convenience, the pants feature a flat front thus you have an easy time accessing your tools. The pants also have many utility pockets to store as many tools as you want. This prevents you from leaving your work to get more tools. 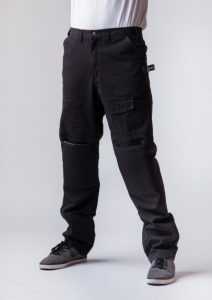 In addition to the many pockets, the work pants also have a quality hammer loop that is highly convenient as it allows you to hang your hammer while working. This prevents you from keeping from going out of the site to correct the hammer now and then. This saves you plenty of time. The work pants also have large leg openings that can fit any work boot you might be wearing. The outfits also have a cleanout feature that helps you to easily get rid of dirt and debris that might have got in the pants. This is highly convenient as you don’t have to go home to struggle to scrub the dirt off the outfits. The button closure comes in handy when removing and putting on the pants as you don’t have to struggle with a zip. To ensure your comfort when working, the work pants have a loose fit thus ensuring that you are comfortable when working. The units also feature a full seat and comfortable thigh design that makes kneeling, and stretching a breeze. This not only ensures that you are comfortable, but it also gives you peace of mind as you know that the pants are designed to handle the tension. When it comes to the durability of the work pants, the units are very durable as they are made from high-quality ring-spun cotton duck material. This material is more woven than other regular cotton or khaki. The material is tough thus ensuring that it lasts for a long time. This means that you save money that you would have spent buying new pants. At the time of writing review, the work pants had over 1,400 reviews and a 4.3 score out of the possible five. While most of the customers were satisfied with the outfits, some were dissatisfied and complained about the sizing. Just like the other work pants, these work pants also have many great features that make them the best work pants for construction. When it comes to the convenience of using the pants, the outfits have a room2move fit that makes it possible to use them on the construction site. The work pants also feature a straight leg opening making them very comfortable to wear with your steel toe boots and any other safety boots you might be wearing. The pants also have many cargo-styled pockets where you can store all the construction tools you might need in your work. This saves you plenty of time you would have spent moving to and from the construction site. The cool thing is that the pockets have flaps thus you can enclose the tools protecting them from getting lost. The flaps also prevent people from seeing what is inside the pockets. In addition to this, the pants have a tough right-side hammer loop where you hang your hammer that you use in your project. The zip fly with the button on the pants also comes in handy in making the pants easy to use in the bathroom. It also makes it easy to put on the pants and remove them after a long workday. Every construction worker wants to be comfortable when working and these pants don’t disappoint. They are made from 100% ripstop fabric that feels comfortable to wear. The straight leg construction of the pants makes them very comfortable as they don’t press you. When it comes to durability, the pants feature reinforced knees that not only protect you from the hazards on the construction site, they also ensure that the knee parts of the pants don’t wear out faster than the other parts of the pants. The high cotton fabric of the pants also comes in handy in ensuring that the pants last for a long time. At the time of writing this review, the work pants had an average of 4.5 stars out of the possible 5 and over 2, 300 reviews. Some of the customers had issues with the waist size. One of the customers said, “the pants are well made, but they run a size or two smaller in the waist.” Due to this, you should be cautious and ensure that you order the right size. Dungarees: Also known as dungarees, these are outfits that feature a pair of jean-type trouser that is attached to an apron type top. They come in many colours, but most people doing manual work prefer the blue denim dungarees. The outfits originated in India, but they are used all over the world. Dungarees are loved by many people as they are made from a tough material (tougher than that used to make the traditional jeans). Due to this, you are guaranteed that they are going to last for a long time. In addition to this, the outfits have a wider leg thus you can easily wear them with your steel toe work boots or any other safety boots you might be using. 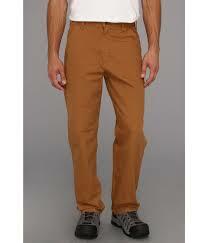 Carpenter pants: They are made from a tough material such as jeans which enables them to last for a long time. In addition to this, the pants have a loose, flexible fit that allows you to easily squat when working. The loose cut of the outfits also allows you to move easily when working. The pants also feature many pockets, loops, and tabs where you can hang the tools you are working with. In most cases, the outfits have a wider waist. This is to allow you to carry a tool belt easily. Cargo pants: They are made from the same material used in making traditional jeans, but they have a major advantage—they have many pockets. The pockets provide you with room to store your tools of the trade. While they might resemble the regular pants, they are designed to fit looser than the regular pants. This is to allow you more freedom of movement when working. 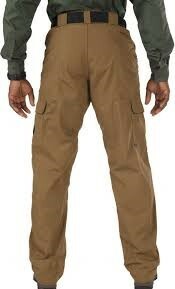 Painter pants: They are similar to carpenter pants and have all the features you will find in the carpenter pants. This means that they have many pockets. They also have loops to hang your hammer and any other tools that you might need. The most identifying feature is their blight colour. While painters popularly used them, they are nowadays worn by all construction workers—whether they are painting or not. Double knee work pants: If you have been in the construction industry for a long time, you know that work pants wear out on the knees much faster than the other parts of the pants. This is because there is more friction in this area due to the regular kneeling when working. The double knee pants solve this problem by featuring an extra fabric that is sewn into the knee area. Due to the extra fabric, the knees don’t wear out faster thus last for a long time. Due to the additional feature, you should expect to pay extra for them. To get the best from the work pants, you need to buy the right men’s work pants. Material: This is important as it not only affects how comfortable the work pants are, it also determines how long the units last. Denim: Denim work pants are thicker and comfortable to wear. They come in a variety of styles such as flannel and fleece, and they are ideal for use during the cold weather. While they are great, they often don’t last for a long time. They also require a breaking in period. The cool thing is that after breaking them in, they are very comfortable. Cotton duck: They are also known as canvas work pants. They feature a smooth surface which makes them less prone to tearing and snagging. 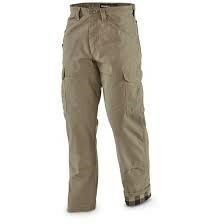 Since they are made from a sturdy material, they are heavy duty work pants and last for a long time. While they aren’t entirely flame resistant, they do very well in high heat situations. They have also been found to be highly effective in windy situations. While cotton duck work pants are durable and great to wear on the construction site, they can sometimes be comfortable especially when they are new. Fitting: How well the work pants fit you is important as it determines how comfortable you are when working. Work pants have three main types of fit: classic, relaxed, and a slim fit. The classic fit is the average fit. The relaxed fit provides you with extra room in the thigh and seat area and is often roomier than the classic fit work trousers. Pants with this fit are often said to be the most comfortable. Finally, slim fit work pants provide you with a more modern fit. They feature a slimmer leg than the classic fit pants, but they aren’t tight. While the pants are a slim fit, they have large leg openings that allow you to wear your safety boots easily. Weight: This is how heavy the work pants feel when you are wearing them. There is no right or wrong weight of work pants that you should wear—it all depends on your preferences and the weather you are working in. If you are working in cold weather, you are better off wearing heavy duty work pants. 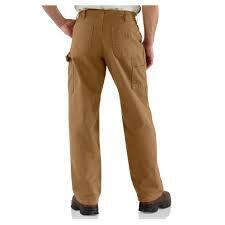 On the other hand, if working in warmer temperatures, wear lightweight work pants. When buying the outfits, you should note that outfits made from lighter fabrics don’t last as long as those made from tough fabrics. The cool thing is that some of the lightweight work pants come reinforced with double knees and seams that increases their lifespan while maintaining their light weight. Seam construction: You should look out for the quality of the seam. As you might have guessed, the poor the quality of the stitching, the shorter the lifespan. Go with work trousers with triple-stitched main seams and taped seams. Also, be on the lookout for rivets and bartacks that are used to reinforce the seams. Zippers: Inspect the zippers and ensure that they are tough to withstand grime, dirt, and repeated use. Waterproofing: If you are working in wet areas, ensure that the work pants are treated with water repellants. This is to keep water beads off the work pants when you are working. If you will be working in windy environment, go for pants that an inbuilt wind blocking technology. Belt loops: As mentioned above, it’s common for the work pants to have belt loops where you hang your work tools. Just like the other parts of the work pants, ensure that the loops are stronger. It also wouldn’t hurt if they are wider and fortified. This is to make sure that they provide you with maximum support for your tools. You will agree with me that good quality work pants don’t come cheap. Due to this, you have to take good care of them for them to last for a long time. Using knee pads: Knee pads are units that protect your knees from damage. They also support your knees thus you can lift heavier objects on the construction site. The pads are made from a wide range of materials such as plastic, rubber, and many others. When you wear the pads you prevent the pants from getting into contact with the concrete surface thus, they don’t wear and tear. For the knee pads to give you the service, you deserve you should buy the right ones. You should pay close attention to the size of the pads. As rule of thumb ensure that they are of the right size so that they fit properly. This is to prevent them from keeping on slipping off thus exposing your pants to the hard surface. You also need to ensure that the pads are comfortable to wear. This calls for you to make sure that they have enough padding materials. Invest in high-quality pants: This is a no-brainer. There is no way you would expect cheap work pants to last for a long time. If you need to continue wearing the pants for a long time, you need to buy good quality units. They should be made from high-quality material. They also should be the right size and fitting. While they will be a little bit expensive, the extra cost will be worth it. Be cautious when working: While you will be working on the construction site that is usually rough, you should be careful of how you handle yourself on the site. As rule of thumb, avoid sitting on the stones as they are known to damage the pants. You also should avoid nails as they can tear the pants. The rule of thumb to consider is to avoid any situations that put your pants at the risk of getting damaged. Clean them properly: It’s important that you clean the work pants regularly so that you can look clean. While this is the case, you should be cautious of how you wash the pants as some cleaning methods can reduce the lifespan of the pants. You should avoid using harsh detergents on the pants. To ensure that you are cleaning the pants correctly, check the back label and follow the given cleaning instructions. This is what you need to know about the best work pants for construction. To get the most from the pants, buy pants of a high quality. They also should be of the right size. this calls for you to buy them from a reputable store.